"Indispensable to New York's jazz scene." 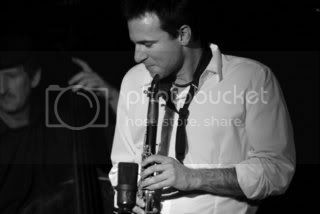 "The Down Under Sax Star"
"a young jazz artist who plays as if he has been playing for over a century"
Adrian Cunningham is an award winning multi-instrumentalist, vocalist, and world traveller. Originally from Sydney Australia and now based in New York, he is proving to be one of his country's top exports. With fluent command of the saxophones, clarinet, and flute, he is one of the finest multi-instrumentalists in Jazz. Proof of this is in the company he keeps, having recently recorded with Jazz luminaries Jeff Hamilton, John Clayton, and Ted Rosenthal with his latest recording Jazz Speak (Arbors), which broke the top 20 in the US national Jazzweek charts. Adrian is the recipient of the Hot House Saxophone Award for 2017. Adrian's band, Professor Cunningham and His Old School, is the winner of international band competition World Jam, (2016, 2017) held each year in Madrid, Spain. Since relocating to New York City in 2008 he has performed at some of the Big Apple's finest clubs- Blue Note, Smalls, Birdland, 55 Bar, Apollo Theatre, Fat Cat, Dizzy's Club (Lincoln Centre) and even a private event at the hallowed Village Vanguard; with such luminaries as Wynton Marsalis, Wycliffe Gordon, Jon Batiste, George Coleman Jr and Jazz luminaries Jeff Hamilton, John Clayton, and Ted Rosenthal , Chris Potter, and Renee Marie. Adrian is currently performing with world-class trombonist Wycliffe Gordon, which included a performance at the London Jazz festival and a recording in Abbey Road studios alongside Wess Anderson, Reginald Veal and Herlin Riley. Adrian has appeared on 2 of Wycliffe's album releases to rave reviews. ("One of the unexpected joys of the album is the rich, woody clarinet of Cunningham" album review; Hot House NYC) Adrian has travelled the globe with the Wycliffe Gordon quintet with a schedule that includes- London Jazz Festival, Johannesburg Jazz Festival, London Jazz Festival, Bern Jazz Festival (Switzerland), Newport Jazz Festvail; and regular performances in New York at the prestigious clubs Dizzy's (Lincoln Center). In 2013 Cunningham formed a tradtional/New Orleans style outfit called Professor Cunningham and His Old School, deeply rooted in the Jazz tradition and has fast become one of the top bands in the international Swing scene, having performed at Snowball (Stockholm), SLOX (California), Blue Note Jazz Fest (NYC), CPH:LX (Copenhagen) and Melbourne International Jazz Festival. Cunningham also has a busy Jazz Festival schedule, being such the favorite of many that he is invited back year after year. Such festivals include, North Carolina Jazz Festival, Central Illinois Jazz festival, Newport, and also concerts at the famous Gennett studios (Richmond, Indiana). International festival credits include Montreux Jazz Festival (3 times!!) Johanessburg, Japan, London, Tokyo and Sopot Molo (Poland). From 2014-2017, Adrian was the leader of the saxophone section of the grammy-winning Vince Giordano and the Nighthawks, a NYC based 1920's swing orchestra; responsible for the soundtracks for Boardwalk Empire and movies including the Aviator. As a leader, he has recorded ten CDs and two DVDs both in Australia with his quartet, and also in NYC through Arbors Records.